Happy Fourth of July, America! Since it’s on a Wednesday this year, we did all our celebrating this past Saturday. Fireworks, friends & food. Good times. 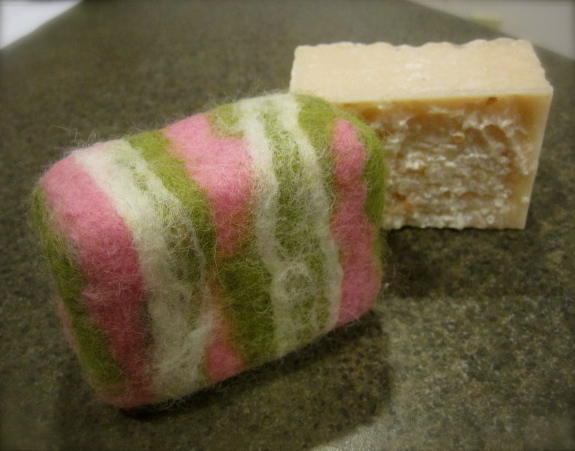 Not too long ago, while incessantly browsing Etsy, I came across something new (for me, anyway) called ‘Felted Soap’. It looks like a soap wrapped in a little patterned washcloth! 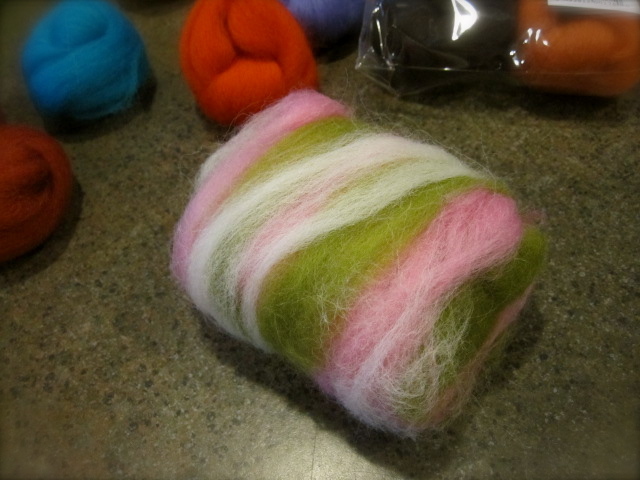 The colors were so soft and pretty, and I liked the fact that the felted ‘cloth’ is made out of 100% wool roving (which is wool that hasn’t been spun into yarn yet). This is especially nice because wool is naturally anti-microbial. I had some salt soap that would be perfect for the project. I used medium-coarse Pink Himalayan Salt all through out this particular bar, and while it’s a fabulous salt, It was too scratchy! I wrapped the roving on one way, and then the other way around the soap. Then, I dipped it into very hot water and started to gently pat it down, and eventually rub it onto the soap. I rubbed until the wool started to felt onto itself. By researching this technique, I learned more about the different breeds of sheep and their wool than I ever thought I wanted to know! As it turns out, I actually did want to know; apparently, wool fibers have tiny barbs. When you rub them, they grab onto each other and don’t let go. 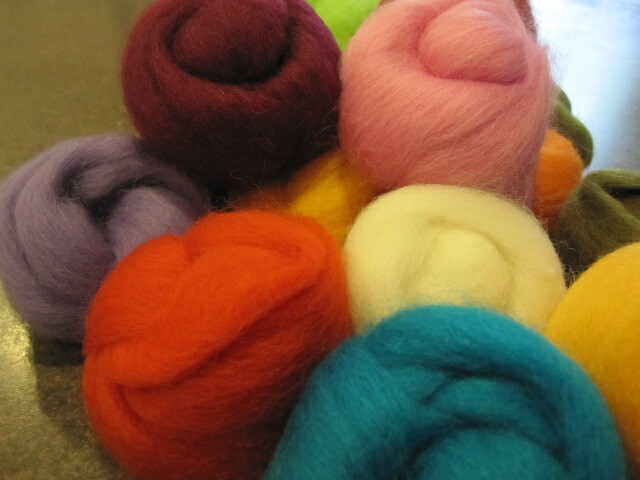 This is what creates the cloth-like ‘felting‘. The hot water helps to shrink the felt around the soap, and it continues to shrink along with the soap as you use it. 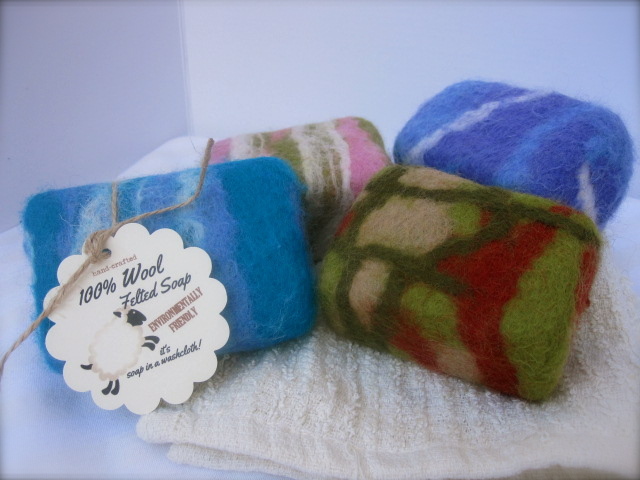 I love using felted soap because it also helps to create huge puffs of lather, and the soaps last longer! When your soap is finally all gone, you’re left with a little scrubbie. You can make it into a pouch by cutting one end. You can put soap slivers into the pouch to use up soap you’d normally throw away, or you could fill it with cat-nip, stitch it up and have an awesome cat toy. You could cut a head and arm holes in it and make a sweater for your Hamster..I’m kidding. If you’d rather toss it, no problem, it’s completely bio-degradable! Coconut Oil and extremely hard. Do not drop this soap on your toe! They do not become mushy in the felt and seem to last forever and a day.. They make adorable gifts and I love using them! Posted in My Hand-Made Soap and tagged cold process, Etsy, felt, felted soap, fiber arts, salt soap, textile, wool, wool roving. Bookmark the permalink.